The best labyrinth game on iOS, Android, WP8 comes to Tizen, ranked Number 1 in 7 contries in the Apple AppStore. 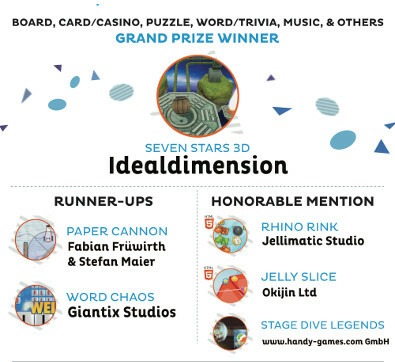 Seven Stars 3D features wonderful gameplay challenges and high quality original Chinese classical music. Have you ever wanted to play a unique mobile game? This one is for you! The main objective of the game is simple: the little cannon's bullet needs to reach the goal. But that's not always that simple: as the levels become trickier, you'll need to figure out how to best use the blocks at your disposition. Tag along with the little cannon and enjoy cutely designed worlds and solve challenging problems, but beware of those ferocious monsters preventing you from exploring new territories and discovering thrilling new puzzles. Word Chaos is a challenging word game that puts your word skills to the test. The object of the game is to form words from a given set of letters. There are three different game modes. In Puzzle Mode you must find all possible words that can be formed from the letters provided, in Timed Mode you must find a specific word within the given time limit and in Relaxed Mode you can play without a time limit. Jelly Slice is an original and unique brain and puzzle game in which the players need to find the best way to slice the jelly to collect the stars. Fun and colorful, you will need a good dose of logic and visual skills to progress through the "sticky" levels. Each level was created so that there is an optimal slicing solution to collect all the stars with the limited number of moves. Kick the same colored rhinos out of the rink in this action puzzle! Build huge chains of rhinos to earn explosive powerups or bonus time. Do you have what it takes to unlock all 6 rhinos? Feel like a real rock star and experience the most legendary moment in rock show history: The stage dive! Smash your guitar, take a run-up and jump into the cheering crowd! Get carried away by your fans' enthusiasm and let them toss you up in the air! Perform crazy stunts, collect golden hit singles and use mighty power-ups like magnets, boosts and balloons to entertain the party people!